Trench coats are the best coat of all time, no matter the season. They have “storm shields” and other fancy amenities (can we use that word for describing a garment?) like epaulettes and D-rings, but their most important feature is what they’re made out of. Most trench coats have a 100% cotton lining (sleeves are 100% viscose) and have a 100% cotton outer layer (Gabardine). Because gabardine is a tightly woven fabric, it is impenetrable against weather and wear. Let me go further, you can wear a trench coat when it’s 25°C & raining and also wear your trench coat when it’s 5°C & sunny because of its cotton composition. 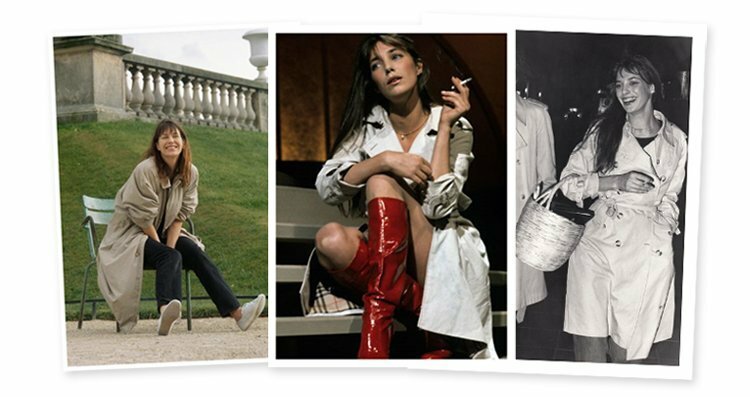 On top of that technical talk, hi Jane Birkin vibes. There is no coat that is as versatile and iconic as this one. With the lightweight material and the 1960’s undertones, this coat was basically made for the summer. The only thing you REALLY need to know about wearing a trench coat (in the summer especially) is that your hemline MUST be shorter than your trench coat’s hemline. When you add a longer bottom layer into the mix it makes the outfit feel too formal, shorter than the hemline makes it look a lot more youthful. The trench coat should fit close to your body, but still leave some room to move in. You don’t want it too tailored. It should also hit just at your knees or above, unless you’re into the super long look. Now, let’s get into some outfit ideas. Note: All of these summer trench coat outfits are styled with my two Burberry mid-length trench coats. Any kind of jean works well with a trench. A skinny jean & trench combo is very Kate Moss 2004, while a flared jean & trench is so Kate Moss 2018. Either way it works. All you have to do is make sure that your top is light (and not long sleeved) so you don’t get too hot. My favorite combination! Alexa Chung basically lived in trench coats and denim shorts in 2008/09/10. Trench coats play off of denim shorts’ casual factor. The trench adds some polish while still letting the shorts be casual. I add Repetto Camille patent flats with these because they add just a bit of even more class. When it comes down to it, the trench coat can work any way you want it to in the summer. … and that’s what makes it the best summer coat! Note, this contains affiliate links, but even if it didn’t, I would still recommend Burberry trench coats!